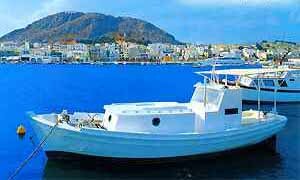 Salamina Island, Saronic Islands, Greece hotels guide, budget hotels in Greece. Salamina, mainly a wooded island, close to Piraeus, in the Gulf of Saronikos, enjoys a frequent shuttle service by motor-sailing vessels, caiques, from nearby Piraeus and from Perama across the Straits. Wheat, olive oil, and wine are produced here, and fishing is also a major industry. The island has good roads and a network of bus and taxi services. At Eandio there are the remains of ancient Telamon. Sandy beaches are at Kaki Vigla, Moulki, Kanakia, Kaminia and Peristeria which is also well-known for its numerous taverns serving delightful Greek delicacies. No large hotels exist on this island as the port of Piraeus just opposite links this island with very frequent ferry shuttle services. The island is, famous for the decisive naval battle between the Athenians and the Persians which took place in the year 480b.c. According to Homer, Salamina was the home of the Greek legendary heroes Ajax and Teucer. It was the object of a conflict between Megara and Athens and was taken by the latter in the 6th century BC. The strait between Salamina and the Greek mainland was the site of the Greek naval victory of the Athenian statesman Themistokles over Xerxes I, king of Persia, in 480 BC. Salamina fell to Macedonia in 318 BC but returned to Athenian control in the following century.